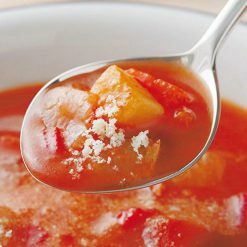 Hearty minestrone soup with lots of potatoes, onions, carrots, red and yellow paprikas, and bacon. 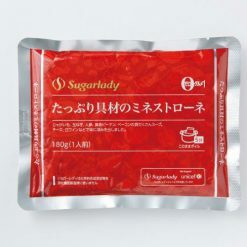 Product totals 180g (1 serving). This colorful and savory minestrone is loaded with potatoes, onions, carrots, red and yellow paprikas and bacon. 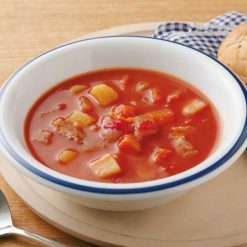 The rich Umami flavor of vegetables and cheese accent this naturally mild tasting tomato-based soup. The soup can be stored at room temperature, so it is useful to keep many in stock. Easily heated and served, it’s a great addition to your breakfast or lunch. Rich in carbohydrate and fiber, this dish also includes vitamin C from carrot – a powerful antioxidant helping vision and the nevous system – and vitamin C from potatoes, paprika and onions, which aids the immune system. Did you know? Minestrone has its origins in Italy, were it was made primarily with leftovers, a staple dish for daily consumption with the purpose of being satisfying and inexpensive. There isn’t a a fixed recipe, as it changes depending on cooking times, seasonal ingredients, etc. It can be quite thik with boiled vegetables, or more runny with lots of lightly cooked veggies, even including meats. Store product in room temperature. Place the bag as is in boiling water and heat for about 5 minutes. Serve in a bowl. This product contains vegetables (potatoes, onions, carrots, red paprikas, yellow paprikas), tomato paste, chicken extract, bacon, potato starch, natural cheese, sugar, white wine, yeast extract, Chinese cabbage extract, garlic powder, paprika powder, white pepper. This product is not suitable for anyone with allergies to milk, soy, chicken or pork.